Your use of this web site is subject to the terms and conditions described below. By viewing this web site, you accept all terms and conditions. These terms and conditions are subject to change without notification. NO WARRANTIES: All information, files or data accessible on or through this web site (this term includes, but is not limited to, this page, sub pages, and information content dreived therefrom) of blockdesk.com, its agencies, departments, boards, and offices are provided solely to facilitate public access to our information. Blockdesk.com attempts to provide current and accurate information on this web site but cannot guarantee the accuracy or currency of any materials or information on its web site. Blockdesk.com provides such documents, files or data accessible on or through this web site "as is" and without warranty of any kind, either expressed or implied, including, but not limited to, accuracy, currency, reliability, omissions or completeness. 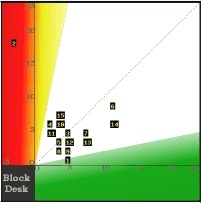 Blockdesk.com shall not be liable for any claim for damages, including lost profits, consequential or punitive damages, exemplary, incidental, indirect or special damages, relating in any way to the documents, files or other data accessible on or through this web site, including, but not limited to, claims arising out of or related to electronic access or the transmission of data or viruses. The content of this web site is subject to change without notice. PROFITABILITY: Blockdesk.com makes no assurance of the profitability of its information. Investments involve risk. No system of information can eliminate risk. The purchaser understands that the information provided including the foregoing charts and underlying analyses are the result of our observations of evaluations made by Investment Professionals other than ourselves and their opinions are subject to change without notice. Historical analysis of market actions subsequent to implied forecasts are for subscriber perspective purposes, are not forecasts themselves, and are not guaranteed to be repeated. Any forward looking opinion is necessarily constrained to the available data in hand at the point in time of such opinion; further, there can be no guarantee that any such opinion is accurate or complete. No warranty, either express or implied, is made that any such opinions can or will be profitable. All liability for damages or loss, direct or consequential, including but not limited to the use, misuse, unavailability of service, or from other causes rests solely with the user. COMMERCIAL and RE-SALE USE PROHIBITED: This web site and the contents therein are intended only for the individual, non-commercial and personal use of web site users. No user of this web site may resell, republish, print, download or copy any portion of this web site or the contents for commercial use without the prior written consent of blockdesk.com, except that reasonable copying or printing of its contents for individual, non-commercial use is permitted. SECURITY: For site security and to ensure that this service remains available to all authorized users, this website employs security measures to monitor network traffic to identify unauthorized attempts to upload or change information, deny service, otherwise cause damage, or access non-public information. Unauthorized attempts to upload information or change information are strictly prohibited and may be punishable under the Computer Fraud and Abuse Act of 1986 and the National Infrastructure Protection Act of 1993. Information regarding possible violations of law may be provided to law enforcement officials. NO LEGAL OR OTHER NOTICE: Communications to blockdesk.com via this web site are solely to facilitate the routine support of product delivery to our customers, and shall in no way be deemed to constitute legal or official notice to blockdesk.com, its agencies, departments, boards, officers, employees, representatives or agents with respect to any existing, pending or future claim or cause of action against blockdesk.com or any of its agencies, departments, boards, officers, employees, representatives or agents where notice is required by federal, state or local law. No communications to blockdesk.com via this web site shall be deemed to constitute legal or official notice for any purpose. LINKS TO OTHER SITES: blockdesk.com's site makes no endorsement or warranty of content outside our control.